Izzy’s broad corporate experience across the financial sector will benefit CIT as we continue to focus on prudently growing our business and meeting our profitability targets. He will serve as a key member of our finance leadership team and I look forward to working with him. NEW YORK--(BUSINESS WIRE)--CIT Group Inc. (NYSE: CIT) cit.com, a leading provider of financing and advisory services to small businesses and middle market companies, today announced the appointment of Israel “Izzy” Kaufman as Executive Vice President, Treasurer effective immediately. He will report directly to Chief Financial Officer Scott T. Parker. Kaufman will be responsible for all functional areas of CIT's treasury group, including funding, asset/liability management, hedging, international treasury, cash management, capital management and rating agency relations. Prior to CIT, Kaufman served as Global Treasurer of Geller & Company. Before this he held a number of senior positions at The Goldman Sachs Group, Inc. including: Treasurer, Goldman Sachs Bank USA; Chief Financial Officer, Global Banking Group, and Vice President, Firmwide Strategy. Prior to Goldman Sachs, he served as Assistant Treasurer of Marsh & McLennan, Inc. and was U.S. Treasurer at Lehman Brothers. Prior to this he spent more than 10 years at Goldman Sachs in its Treasury and Investment Banking areas. 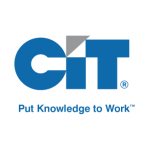 View CIT’s corporate overview video (cit.com/corporatevideo) that showcases our support of the small business, middle market and transportation sectors.